A beautiful city steeped in History with the Castle overlooking the city. Great for shopping and lots of lovely restaurants to try, not forgetting the beautiful beaches. Alicante is only 1 hour driving from Beniqueen. Great night life and wild choices of eating in terraces in the centre. The station is about 15 minute walk or a 5 min taxi ride. There are two taxi stands near by. If you exit the house and go in either direction you will find one. Once there you can catch the AVE Speed train to Madrid and be there in 2 1/2 hours. Or anyplace else in Europe your heart desires. If you want to get out of Valencia and visit some beautiful beaches, then taking a bus to Alicante is the perfect option. It takes just over an hour and a half to get there and you will leave the bustle of Valencia behind, to find a very different kind of Spain. With many Spanish bus companies offering cheap fares it is a budget friendly day trip. The beaches of Alicante are completely different to those you will find in the city of Valencia, and with Alicante's striking blue water and warm sand there really is no contest! A really lovely place. It rained most if the time when my husband and I came but its really nice. If you come, drive over to Valencia as well. Beautiful city! - its Central Market is only open in the mornings and offers a combination of flavors and perfumes that you cannot resist. - Santa Barbara's Castle reigns from the Benacantil mountain, with its characteristic Moor's Face. You may enjoy of fantastic views of the coast. - The main shopping area is on Maisonnave Street, with top international brands like Benetton, Zara, Woman's Secret and the well-known El Corte Inglés Department Stores. - The Bonfires Museum has free entrance all year round, and introduces the visitor to Alicante's main Feast: Saint John's Bonfires, which is of International Touristic Interest. 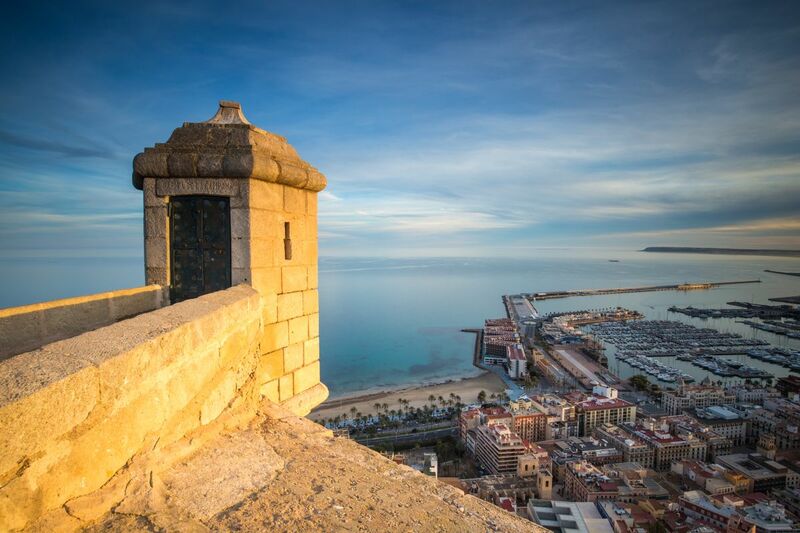 - Alicante's Old Town, where the City Hall is located, with narrow streets and great nightlife invites the visitor to get to know the best gastronomy and local entertainment. - And whenever you need a rest, you may lay down on Postiguet Beach and enjoy the sunshine.